Wanna turn your home into 3D theater? This Virtual Reality 3D Glasses can fulfill all your dreams of watching 3D movies and play immersive games at home. Just with a smart phone, you can turn 2D movies to 3D movies at once, giving you feeling of being in the scene. Press to talk when there is an incoming call. Volume can be controlled during talking, watching movies or playing games. This amazing VR Glasses gives you amazing using experience. Just with a smart phone, you can turn 2D movies to 3D movies at once. Greatly enjoy 3D movies in your mobile phone. Left-right 3D movies should be downloaded if you want to enjoy 3D movies with 3D VR Box. It&apos;s perfectly compatible with Android iOS Windows smart phones from 5.5-6.2 inches. It brings you wonderful experience of playing immersive games with gamepad (not included). 360° Panoramic design takes you into a new world, giving you perfect visual enjoyment. 120° wide viewing angle is close to human eye real viewing angle. 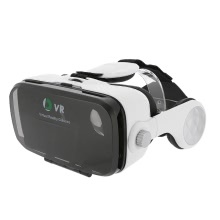 Works with various iOS / Android virtual reality Apps on Apple App Store and Google Play Store. Search VR games / 3D split screen on Google Play or APP store to enjoy shocking 3D effect. Adopts imported PMMA professional optical material, it brings you HD images which effectively blocks harmful rays and ease tired eyes aspheric design optical correction. Move the lens left or right to adjust pupil distance and rotate the button front and back to adjust focal distance which is perfectly suitable for shortsightedness within 800°. Full-covered advanced and close fitting flocking material is safe, non-toxic, harmless heat dissipation and comfortable for a long time wearing. Comfortable to use. With high strength and high toughness nylon straps, you can adjust it according to your head size. Flexible headband can be adjusted forward and backward according to head size. Earphone space for connecting with phone which is convenient for talking function. Volume button and call key below are convenient for answering calls.